If you are a musician, odds are you have thought about playing different instruments. Maybe you have thought of playing multiple instruments, or you already do. Playing multiple instruments is super common in music, especially for professionals and advanced amateurs. Whether you play multiple instruments in the same family, or you play all sorts of instruments, it can be tough to handle. You have to be able to give each instrument its own time and attention, and you have to be able to keep track of them all. 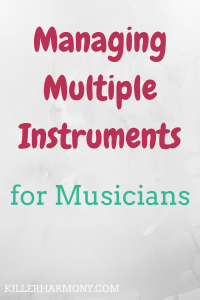 So, here are a few tips for managing multiple instruments. I know I say this a lot, but prioritizing is the key to success when you have a lot going on. Odds are, you cannot treat all of your instruments with the same priority. You have to choose which is the most important. If you haven’t already, you need to pick one instrument that is your main instrument. That is the instrument that will always get attention before the others. It is what you play in ensembles. It is also, usually, the instrument you have played the longest. By picking a primary instrument, you know just what to practice if you are severely limited on time. 2. Determine the instruments’ relationships and purposes. How are the instruments you play related? Do you mainly stick to string instruments? Are you a flutist who plays piccolo and alto flute? Or do you play instruments from different families. Once you determine how all your instruments are related, and what purposes they serve, you can better organize your collection of instruments. You may be a trumpet player who dabbles in piano, because your music degree requires piano proficiency. Or, you may be an oboist who still plays clarinet sometimes so that you can join marching bands or play in musical theatre shows. Your instruments’ relationships and purposes will help you further prioritize and manage all of your practice. If you have a piano exam next week, you should probably focus on piano. If you only want to play guitar for fun, let it be a stress reliever. The more instruments you play, the more equipment and sheet music you will have. When you have more stuff, it is hard to keep it from becoming a huge mess in your room or your locker. Organize your sheet music into different folders based on instrument and even the type of music. Get different bags or folders to organize your music equipment. Keeping organized means you won’t be searching for a clarinet reed when you need it. Your reeds will be with your clarinet, and your rosin can stay with your violin. You will be less stressed. If you have a certain amount of time to practice any instrument, you should make a schedule to stay on track. If you only have an hour, you should probably focus on your main instrument. Have more time? Warm up and practice your main instrument, and then move to your other ones. Use your upcoming events to figure out what needs the most attention. If the marching season is over, odds are you won’t need to spend time on the mellophone. Are methods exams coming up? Get out those beginner books and practice for your test. 5. Get the right gear. If you have a ton of instruments to deal with, you want to get some gear that will help. There are cases which can hold multiple instruments, if you play combinations often. You can also find instrument stands for just about any instrument. As a flutist who frequently plays piccolo, I love having a flute bag that will fit both. I can grab my flute bag knowing that both instruments I need will fit, and I can cut down on bags to carry. If you play a larger instrument, you can even find a case that has a pocket for your music. Instead of carrying your instrument and also a music folder, you can keep everything together. For the pianists, you can get a binder, a multi pocket folder, or a good tote bag to keep your music and metronome in. If you play more than a couple of instruments, you probably won’t play all of them every day. That is completely okay. Things happen, and we might not have as much free time as planned. This is where it is important to be flexible. If a guitar string breaks and you’re out of replacements, move to another instrument. If all your reeds have gone bad, take a break and practice piano or something. Flexibility is hard, but it is necessary when you have a lot going on. You need to remember that you chose all of these instruments, and you should be able to go with the flow that they all bring. 7. Music should be fun. Whether you are an amateur or you want music to be your career, keep at it for the music. Music should be fun. Adding multiple instruments to your arsenal is awesome, because it adds to the amount of music you can play. If you want a career in music, it will help you to play multiple instruments, but play music because you love it. If you only add in another instrument because you think it will get you more money or fame, you are doing it for the wrong reasons. How many instruments do you play? I play flute, piccolo, piano, and I have also dabbled in many other instruments. So, let me know if you would like to hear or see me play! And, of course, don’t forget to subscribe below for awesome tips and insights delivered right to your inbox! Subscribe & Join the Killer Email Squad!